I attended Cambridgeshire’s Police and Crime Panel on the 5th of February 2014 where the panel voted to approve a 1.92% increase in the policing element of council tax for 2014/15 as Police and Crime Commissioner Graham Bright had proposed. The report to the panel on the proposed increase was presented by Niki Howard, the Director of Finance & Resources for Cambridgeshire Police; who the Police and Crime Commissioner Graham Bright has appointed his acting Chief Finance Officer. In my view this makes a mockery of commissioner Bright’s claims to be operating independently from the police. I had used the public participation slot at the start of the meeting to raise this concern, and also to urge the panel members to ask the commissioner how he can justify the increase given a key element of his election campaign was a promise to put no extra burden on council tax. (I also asked if the Commissioner’s emails, and IT, were being handled by the police meaning the physical separation of his office from police HQ is just symbolic). No panel members took up my suggestions of points to raise. 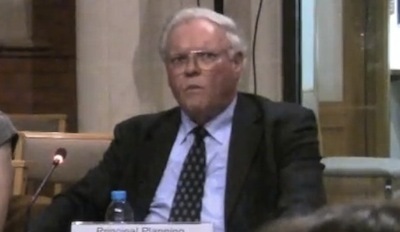 Police and Crime Commissioner Graham Bright sought to distance himself from the council tax hike proposal and told the panel that his friend Brian (who he has appointed Deputy Police and Crime Commissioner) was the architect of the tax hike he was asking the panel to approve. While the majority of those panel members voting supported the commissioner’s council tax hike only Conservative Cllr Curtis explained his reason. Cllr Curtis astonishingly said that the council tax rise would be affordable to those on low incomes as they would have extra cash as a result of increases in the tax free income tax allowance. Cllr Curtis made this statement after two of panel members from Peterborough had raised concerned about the affordability of the rise, claiming there were already queues of people unable to afford their council tax outside the magistrates courts in Peterborough. Cllr Curtis made no comment on how he expected those on fixed incomes, such as pensioners, to afford the increase, though he did cite surveys saying people are prepared to pay more council tax. Cambridge’s representative, Liberal Democrat Tim Bick, left the room while the vote on the council tax rise was taken. The commissioner’s chief of staff informed the panel that a few moments before the meeting started the government had announced the level of council tax increase which would trigger a referendum. This threshold was set at 2% so the commissioner’s proposal will not require approval at an expensive referendum. The fact the panel’s own officers weren’t providing the panel with this key information for them to consider while deciding if to approve the proposal or shows a worrying lack of independence in the panel’s operations. The Police and Crime Commissioner issued a press released following the Police and Crime Panel meeting; reports in the local media appeared to be based entirely on that press release and did not reflect the concerns about affordability which had been raised by panel members at the meeting. This entry was tagged Graham Bright, Police and Crime Commissioner, Police and Crime Panel on February 23, 2014 by Richard Taylor. Interesting that yesterday the chancellor announced no increase in council tax, presumably unable to control the runaway train aka the commissioner’s office which had already announced a £3.50 increase in the policing precept. To rub salt in the wound his stated reason, to maintain frontline policing, looks pretty hollow with a reduction from 180 PCSO’s this year to 150 in 2014/15. For most rural (and probably urban) communities, the PCSO is the frontline. What is announced in Parliament on council tax has no relation to reality; as it’s Police and Crime Commissioners, councillors and fire authorities that set council tax locally. If MPs want to prevent a council tax increase they need to do more than just ask local politicians not to raise it. Essential reading on the life of a PC can be found in ‘Wasting Police Time’ by PC David Copperfield. I appreciate the limited authority of a PCSO but as soon as a Constable, makes an arrest or starts any judicial process he/she is lost from the frontline for days. A PCSO with no more powers than a citizen (which he/she is unlikely to use) can offer some visible reassurance with no risk of having to spend hours putting files together. The real challenge for the criminal justice system is to streamline the administration and cut out the time wasting dross which takes so much time. We live in a risk averse society which is great for crooks. We can remove the risk of PCs being taken away you refer to through management and policy decisions. If we’re spending money employing someone my view is it may as well be the best person we can get and we should give them the full powers of a constable. I agree with your point about speeding up the justice system. Slow justice means there isn’t justice, and it’s detrimental to all involved. It get’s better. The commissioner now has an ‘outreach worker’ (your guess is as good as mine) who will be standing outside Sainsbury’s in Bretton Peterborough asking shoppers what they want the police to do. Not sure if that includes asking what the commissioner and his entourage should do. So just as you are looking forward to some recreational rummaging in the freezers before you cross the threshold you will have to battle through the massed ranks of big issue sellers, charity workers, miscellaneous beggars,tethered dogs and now the ‘outreach worker’. With shopping eventually in trolley and you search for the cash to pay is this not an apt time to ponder that your taxes are helping to pay for the ‘outreach worker’s’ appearance?. It is proposed that the contact point could be at the Information Service Desk within the store. This is something I’ve drawn attention to before. You may have seen that Sainsbury’s share price has fallen 25% in recent months. If I was a shareholder I would not be optimistic that the commissioner’s outreach worker haranguing shoppers will be of benefit to the bottom line. There is an Aldi almost next door and we know how well they are doing. I would rather drive to another town than risk a close encounter of the outreach kind.